Finding the right hair styling tool can be a difficult job. For the perfect fit, you need to find one that can do what you need it to, and it has to do it well. Beyond that, it also has to be easy to use, easy to store, and, very importantly, within your budget. So, which is the best hair straightener? 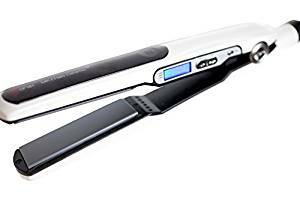 The BaBylissPRO Nano Titanium-Plated Ultra-Thin Straightening Iron is a hair straightener that, as the name suggests, is produced by the hairstyling tool giant, BaByliss. This iron, in particular, is designed in such a way that anyone, professional or otherwise, should be able to use it. The plates in particular are the main feature to pay attention to: They’re longer than the average hair straightener’s plates, which claims to help cut the time spent straightening in half. The plates also seem to boast better materials than the average hair straightener, being made of Nano Titanium. This is to help provide a more even heating experience, thus making the results better and longer-lasting. And it does get hot: It can reach up to 450 degrees Fahrenheit! The last major feature is the sizes. There are three to choose from: 1 inch, 1.5 inches, and 2 inches. This gives you a variety of choices for any hair length. The heat that you can achieve is higher than average, reaching 450 degrees. This straightener has plates made with Nano Titanium. Three different sizes, for different hair length. Longer plates, which can cut down on the time spent straightening your hair. Comes from a well-respected brand. The price isn’t exactly low. The average price on Amazon is approximately $140. Because of the high heat, you run the risk of burning your hair if you aren’t careful. The different sizes can mean buying a new straightener if you get a new haircut. All things said, the BaBylissPRO Nano Titanium-Plated Ultra-Thin Straightening Iron is a good choice for those who don’t have a lot of time to get ready in the morning. It’s also a must-have for those with really long hair that need a little extra space on the plates. The price tag is high, but it’s likely worth it. For those looking for a salon-quality hair straightener without paying well into the triple-figures, the RUSK Engineering CTC Technology Professional Straight Iron might be the perfect place to start. The most eye-catching thing about this hair straightener is the price: It averages about $100 on Amazon, making it one of the less-expensive options. But that doesn’t mean that it doesn’t work well, nor that it comes with fewer features than some of the more high-priced flat irons on the market. In fact, it seems to fall right in with other higher-class irons. The plates are the first place to look, of course. In this case, they’re 1 ¼ inches wide, for a secure hold on any hair. They’re also made of ceramic plates, infused with both titanium; they come with sol-gel technology. The ceramic heater also makes it easier to get the iron hotter, providing quicker, easier-to-hold styles on hair of any kind. The cost is the biggest plus with this iron. At approximately $100, it’s on the lower end of the spectrum, making it good for big style on a budget. The plates are sized well, so that it will work on any length or type of hair. No changing out straighteners because of a haircut! The plates are made of durable titanium-infused ceramic, making it easy to heat up and style your hair. This also means that frizz is a non-issue here. There are no ways to get a truly personalized hair style with this. You have one option only. The RUSK Engineering CTC Technology Professional Straight Iron is a great choice for people looking for a good, does-anything hair straightener on a bit of a budget. 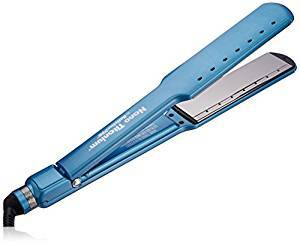 This straightener works for everyone, and has a lot of the perks that one would look for, all for a fairly reasonable price. Sure, hair straighteners are great. But what if you want to straighten one day, curl another, or even flip your hair? Well, the Karmin G3 Salon Professional Ceramic Flat Iron is a tool designed to handle all of that! Made by a well-known brand in the beauty industry, Karmin, this flat iron is more than just a flat iron: It can do all that was listed above, as well as help add volume to hair for more daring or full hairstyles. This is because of its specialized plates: They are 1 inch wide, which is the perfect size to be able to handle all of those tasks, going beyond just straightening. The plates are made of tourmaline ceramic, for sleek-looking, manageable hair, no matter the style. In a rush? This iron heats up in under thirty seconds. This item also comes with a heat mat and carrying case combo, for added convenience. The most defining ability of this iron is that it can straighten, curl, flip, or add volume to hair. This flat iron comes with a heat-resistant mat and carrying case combo, for ease of use. Works well for most hair lengths, styles, and textures. Heats up in under thirty seconds. The price is a little much, with the average on Amazon being approximately $150. Tourmaline ceramic, while good, isn’t anything out of the ordinary as far as hair straighteners go. Many others use the same material. 1 inch plates are a bit on the small side, for straighteners. 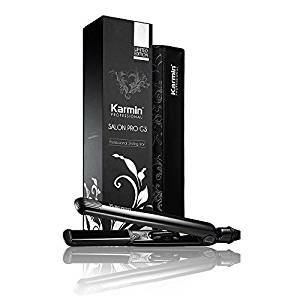 The Karmin G3 Salon Professional Ceramic Flat Iron is decent hair straightener that really only becomes worthwhile if you’re looking for one tool that can handle not only the straightening, but anything else you would use a heated styling tool for, as well. The convenience of the heat-resistant mat/traveling case, as well as the quick heat-up time, help it stick out from the crowd. For those looking for the absolute best on a very tight budget, the Professional HSI Flat Iron is most likely going to be the best option on the market. This is a flat iron that can do almost anything: Not only can it straighten hair, but it can also curl and flip it, as well. Not only that, but the temperature is adjustable, going from anywhere between 240 degrees Fahrenheit to 400 degrees Fahrenheit, making it a good choice if you tend to make a lot of changes to your hair. This adjustable heat means that delicate hair won’t be burnt, while thick, coarse hair will be sleek and smooth. The plate size, too, is great, perfect for use on bangs as well as the rest of your hair. Do you travel the world a lot? Then this is one tool you shouldn’t leave at home: It’s dual-compatible. All of this for just the average price of $40. The low price is the biggest pro you’ll see with this flat iron. At roughly $40, it’s a steal. The adjustable heat makes it a great choice for those who want to take it easy on their hair some days, or for those who sometimes need more staying power. It can be used within the United States or abroad, as it is dually compatible with both electrical systems. Besides the price, the ability to travel overseas, and the adjustable heat, there’s nothing else to really write home about. It’s a good straightener, but not absolutely fantastic. 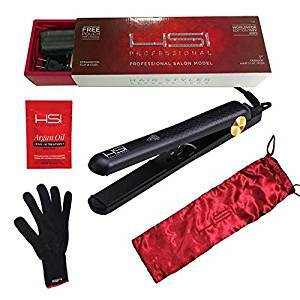 The Professional HSI Flat Iron is a great bargain straightener, and likely the best low-cost model that you’re going to be able to buy. It can also work for almost everyone, and can be taken almost everywhere. If you’re looking for a starter iron, or just want something that’s a bit all-purpose for a low price, this is the iron to choose. From one of the most famous brands in the styling industry, the CHI Air Expert Classic Tourmaline Ceramic Flat Iron really stands out from the crowd when it comes to hair straighteners. The fact that it is manufactured by CHI, one of the most commonly-purchased brands for salons across the globe, gives it an air of respectability. It also means that it does come with some perks and extras that others might not. A good example of that would be the variable heat control option, allowing you to adjust between 180 degrees Fahrenheit and 410 degrees Fahrenheit. This gives you more control over how much heat that you use on your hair, either preventing heat damage or giving the straightening power a little extra power. It also has the ability to do more than straighten: This iron can curl, flip, wave, and spiral, too! The price is a bit high, at an average of $110, but not unmanageable. Comes with a wide degree of heat variation, from 180 degrees to 410 degrees. Has tourmaline ceramic plates for more even heating. Can be used for straightening, flipping, curling, swirling, and waving your hair. The price is a bit high for a fairly basic, albeit CHI, straightener. The CHI Air Expert Classic Tourmaline Ceramic Flat Iron is a great choice in flat iron for those who are wanting something big-name without paying outrageously high costs for it. It isn’t, however, for someone who wants a low-price straightener. The perks definitely make it worth it, and the brand name doesn’t hurt, either. If you’re the type of person that is always in a rush, and are looking to cut down on your hair-straightening time, then the BIO IONIC Onepass Straightening Iron is one that you’re likely going to be interested in. The most prominent feature of this flat iron is the little time that it takes to actually straighten hair. As the name suggests, it claims that it takes just one pass. Many other flat irons, even the most expensive, take multiple passes for even the easiest-to-manage hair. This straightener even comes with some rather unique silicone speed strips, to keep you moving faster while you’re getting ready in the morning. The negative ions that it puts out are designed to keep your hair sleek and frizz-free. And it gets hot, reaching a temperature of up to 400 degrees Fahrenheit; this allows for some extra hold and for a more thorough straightening job. It should only take one pass through your hair to achieve a sleek, straight look. Comes with silicone speed strips, to make straightening an even faster process. Reaches temperatures of up to 400 degrees Fahrenheit; the heat settings are adjustable. Emits negative ions, to keep hair sleek and straight. The biggest downside here is the price. At rough average of $200 on Amazon, it’s definitely a pricier option than most others. Plates are only 1 inch wide, which could be too narrow for thicker, coarse hair, and isn’t good for straightening a lot of hair at once. 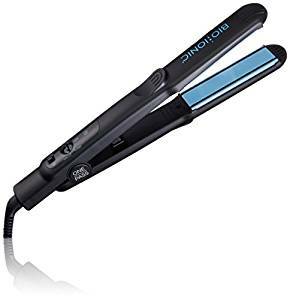 If you want something that can work fast, and money isn’t a real issue that you have to worry about, the BIO IONIC Onepass Straightening Iron is the perfect flat iron for you. It has a lot of perks that you could be happy with, but the time saving features are what will really stick with you. 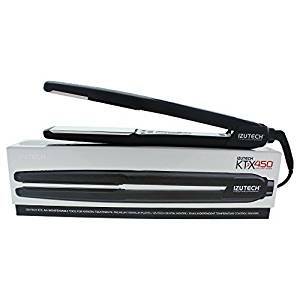 Another option for those who want to get their hair straightening finished as soon as possible is the Izutech Ktx 450 Titanium Digital Flat Iron. This flat iron boasts that it can straighten hair in just one pass through, which could seriously cut down on the amount of time it takes to get through such a lengthy part of your morning routine. This straightener is also a good choice for those that either already have damaged hair, or those that are hoping to prevent it: The titanium-infused plates help to heal damaged hair, as well as provide increased elasticity, which will reduce breakage over time. Suitable for all hair types, this is a straightener that is a great choice for everyone, regardless of how long your hair is, or how thick or thin it might be. The price isn’t exactly monstrous either, with the average on Amazon being around $112. This flat iron claims that it can straighten hair in just one pass through, cutting down time spent straightening. Titanium-infused plates are designed to heal damaged hair and to increase elasticity. Hair straightener can be used for all hair types, no matter the length, thickness, or texture. The price is a bit much for a hair straightener that doesn’t boast many state-of-the-art features. There is no way to control the temperature that this flat iron reaches. Some find that the temperatures can be too low to really straighten or style their hair. There are a few claims that make the Izutech Ktx 450 Titanium Digital Flat Iron unique. For instance, the claim that it improves hair health and elasticity is one that you won’t find everywhere, and may make it worth the money. 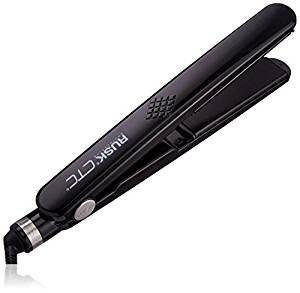 However, with the cost, as well as the low-quality some report, there are better flat irons on the market. The major downside to most hair straighteners is that they only work on dry hair. This means taking extra time out of your day to dry it first, then straighten. But with the BaBylissPRO Nano Titanium-Plated Wet-to-Dry Ultra-thin Straightening Iron, you don’t have to wait for your locks to air out before starting. This flat iron, with its 1 ½ inch plates, can dry damp hair while it straightens, so you don’t have to go through such a strenuous process anymore! This can cut back on time spent getting ready in the morning. The titanium plates are a good choice, as well, because they are fairly easy on your hair, leaving it healthier, sleeker, and shinier than it was before. The price is a bit much, with the average price on Amazon being $140. But, for a tool designed by one of the most famous companies stying companies in the world, it might be worth it. You can straighten your hair before you completely dry it, saving time in the morning. The titanium plates make your hair look healthier, making it sleek and shining. Has a 1 ½ inch plate, meaning you can straighten your hair faster. Made by a world-renowned company. The price. At $140, this is an expensive straight iron, no buts about it. It might be too much for some budgets. No real temperature control, making it a real one-size-fits-all kind of tool. The outside can become hot to the touch, making it uncomfortable to use. 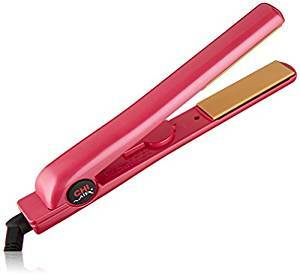 Though it can do things that many other straighteners can’t, the BaBylissPRO Nano Titanium-Plated Wet-to-Dry Ultra-thin Straightening Iron likely isn’t worth the high price that you would end up paying. Even if drying still-wet hair is something that would shave precious time off of your routine, it’s not enough to warrant the price tag for most. Are you looking for a hair straightener that has a bit of everything to offer, but for a budget-conscious price? Then the Onei MK-I Halo Ceramic Flat Iron is probably going to be the iron for you! It not only allows you to straighten hair, but also to curve and flip it, allowing you more hairstyle options. The heat is adjustable, allowing you to set it from anywhere between 140 degrees Fahrenheit to 450 degrees Fahrenheit; this can produce easier straightening, or even save your hair from damage during the straightening process. The ions that it puts out help to keep your hair smooth and sleek. Worried about the safety features, or about leaving it on? This comes with an automatic 30-minute shutoff! Along with straightening, this iron can also be used to flip and straighten hair. The heat is adjustable, and can be set anywhere between 140 degrees Fahrenheit and 450 degrees Fahrenheit. Infrared and negative ions are designed to leave you with sleek, shiny, healthier hair than before you straightened it. Comes with an automatic 30-minute shutoff, to prevent accidents. Has a fully digital display and adjustment. The average price on Amazon is $100. There is no tourmaline ceramic, nor any titanium-infused ceramic. Fairly basic size for a straight iron of its type. This is a straight iron that is best for everyone. It has a little bit of everything, for what is considerably a very low price. For those uncertain as to what they need in the long run, and for those who already know, this is your straightener! Are you going to be using a flat iron for keratin treatments? Or do you just like easy, touch-of-a-button, but numerable, options? 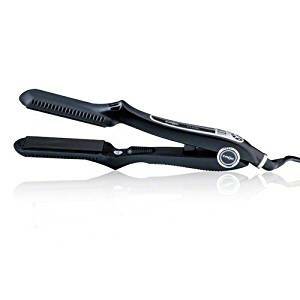 Then you should check out the Turboion Rbb Croc Classic Straightener! 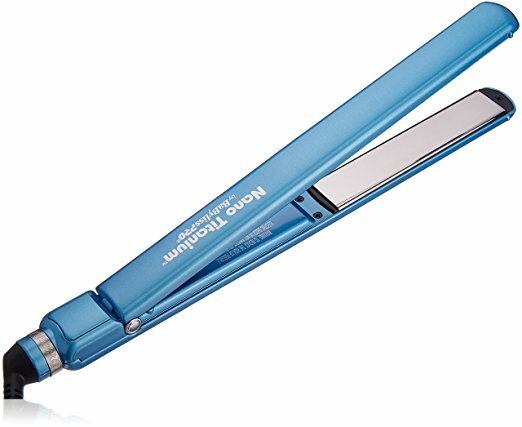 A really professional straightener, but easy to use at home, this is a top choice for use in heat-infused hair treatments. The titanium plates, along with the ceramic heaters, make it perfect for getting the right amount of heat for your style. Along with that, there are so many different options to choose from. It has seventeen different heat settings, all easy to change and adjust as you go. All of this is perfect for everyday use, as well as for when you’re feeling like pampering yourself. Perfectly designed for use with heat treatments, including keratin. Has titanium plates, for smooth, frizz-free straightening that leaves your hair sleek and shiny. Has seventeen different heat settings, so that you can always find the right one. Plates are 1 ½ inch wide, making it easier to grab and straighten large amounts of hair at once. Ceramic heaters help to evenly distribute heat while straightening your hair. The only downside here is the price. At an average of $140 on Amazon, it can be a bit expensive, especially for a first-time straightener. The Turboion Rbb Croc Classic Straightener is perfect for almost anyone looking for a hair straightener. It’s great because it has all of the extras that you want for everyday use, as well as the ability to be used for heat treatments. A good choice all around, even with its high price. A lot goes into picking out the perfect hair straightener. You need to find one that fits what you’re looking for in a styling tool, and one that fits your budget. These flat irons are all decent choices, but only you know which is truly right for you.